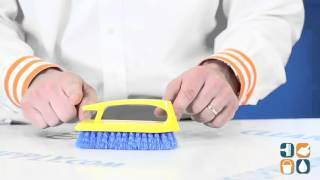 Each Rubbermaid cleaning brush is equipped with a molded, long, handle which gives you a powerful grip to ease the work of scrubbing floors, countertops and walls. This scrub brush with a handle features long-lasting polypropylene fill resist stains, and its materials it is composed of provides for a durable brush you can trust on for a while. 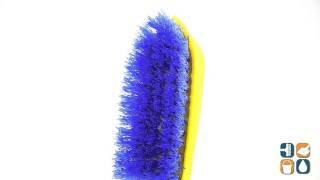 Bristle Material: Polypropylene; Brush Length: 6".